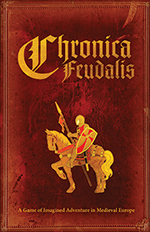 Chronica Feudalis is a historical roleplaying game set in the Medieval period (but non-fantasy). The game is an interesting combination of traditional and indie, using step-die mechanics like Savage Worlds and aspects like Spirit of the Century. The rules treat skills, tools, conditions, etc., consistently. Character creation and development focus on the selection of mentors. The result is an approach that makes character background meaningful and lends risk to both combat and non-combat situations. Interesting, here in Brazil we have something like that, it’s called Chronicles of Avalon (Crônicas de Avalon), its a d20 game with some small diferences and focused in the arturian legends, magic is very subtle (no boom spells), it’s very nice. Another option is Midgard, a viking based d20 game, but a bit more fantansy-like.